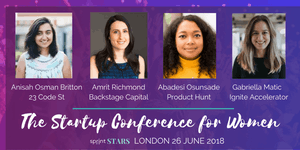 Sprint STARS conference, London 26 June, brings together a powerful line up of Role Models, Thought Leaders, Female Entrepreneurs and Women in Tech all in just 1 day. Immerse yourself in engaging panels, interactive workshops, mingle with like minded people over lunch or lay back and take some notes listening to inspirational talks or get soaked up during a power hour. You will be taking part in an unforgettable day of learning and inspiration. Expect; Inspiring talks, fireside chats, networking, power hour and workshops bringing together people, ideas and resources, oh and did we mention lunch with the speakers? Learn something new, foster collaborations, forge a network of go-getters and rub shoulders with role models from all walks of life. You will gain insights on how the fastest growing startups deal with success and adversity, and how to start building and maintaining your own momentum. Join startup.sprint a series of workshops to get you up and running. Want to partner with us for a giveaway, event launch or content creation? Get in touch! To keep up-to-date with our activities and upcoming events, follow us on Twitter, Facebook, Instagram, LinkedIn or sign up to our newsletter.